St James was the location for the weekly farmer's 'beast' market from at least 1732 until a new, purpose built market was built in South Street (east of the junction with Church Litten) in 1928. 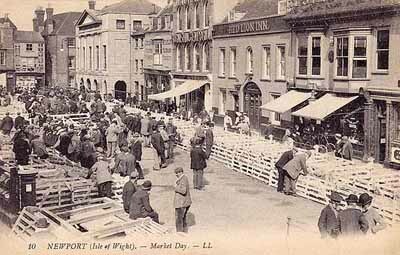 That market was demolished in the late 20th century (together with St Thomas' Church Hall and Canning Day's car showroom) and is now the site of Morrison's superstore. After the market moved out of St James Square, the square became the main stopping point for buses in Newport. In the early years, there were a number of bus companies operating in and out of Newport but over the years, the number of companies reduced until Southern Vectis was the sole one remaining. 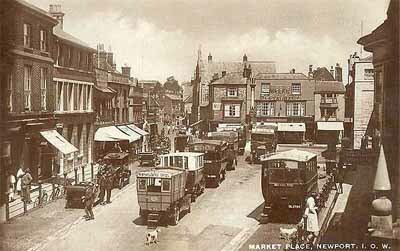 The square continued to be the bus station until the purpose built Southern Vectis bus station open in the early 1960's on South Street. That Bus Station was demolished cira. 2010 and the site redeveloped with a row of shops facing onto South Street with a new bus station behind off of Orchard Street.